Starbar EZ Trap Fly Traps -- 2 Pack. $9.99. 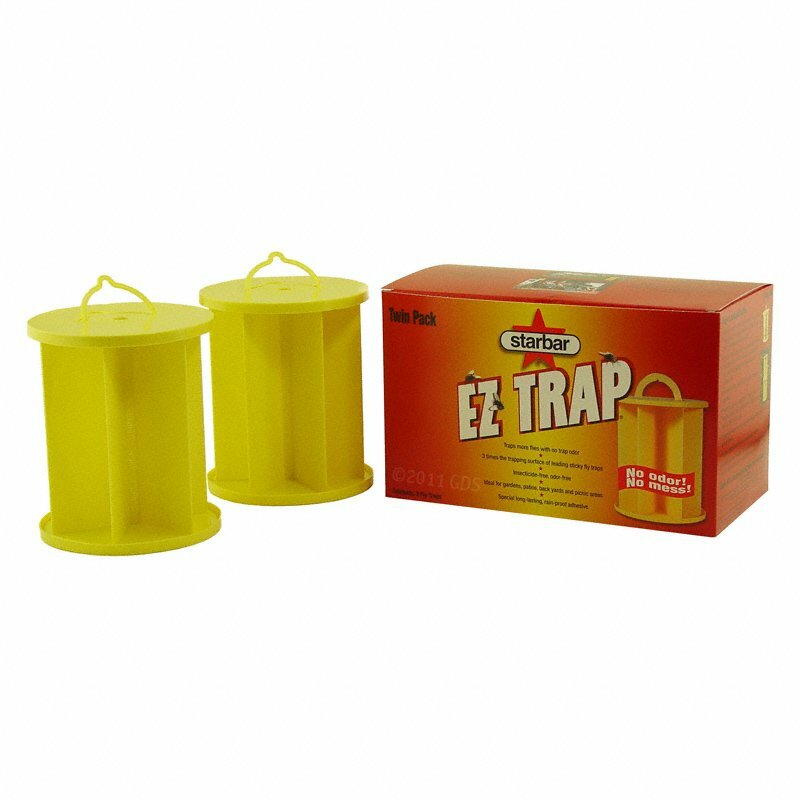 Today we're looking at the Starbar EZ Trap. These are great little traps. I use them down at the kennel. They are designed for your common housefly. They'll catch some other bugs, but that's really what they're going after. It's the flies that bug you. Common houseflies are going to be attracted to dogs and your kennel. These are great for that. It's just a sticky trap. It's designed to look like fruit. That's the concept as far as what the fly is going to be attracted to. The color is what brings them in. They are sticky traps and they will catch pretty much anything. They set up several different ways. It's got a hanger on it. I just tie a little rope to mine and hang them in the kennel. You want to keep them out where sunlight helpsâ€”something for the flies to see. Put them in the common areas where the flies are. This does not have any sort of attractant on it. It's not going to bring flies in. but they will be attracted to it visually and then they're going to get stuck to it. It's got both sides, so you can hang them all sorts of different ways if you want to. It's also got a hole all the way through the center so that you can put it on a pen. And you can double-stack them if you need to. It comes in a two-pack. Great little traps,. I've got one in every one of my dog runs. Once they get lots of flies on them you can actually wash them off and use them again. So they've got a pretty good lifespan to them. At a certain point you are going to want to chunk them and start over. Neat little trap. Works great. "Works great, attracts hornets too." Works great, attracts hornets too. "My yard, which is fenced, is nearly cleared of all flying pests." My yard, which is fenced, is nearly cleared of all flying pests. We can weed, prune and most of all chill out in our back yard. We have been using this product for several years, and the effect as it wipes out the breeding population just gets better. The wonderfulness of the product, the price and great service has made our family a loyal and grateful fan. Our backyard now belongs to us. They work great and there is no dead carcass smell. "Not toxic and cuts the flies down around my outside dogs." Not toxic and cuts the flies down around my outside dogs. Includes 2 EZ Traps. Field studies prove the EZ Trap by Star Bar traps 3 times as many flies as other sticky fly traps. Its unique, compact design offers a large trapping surface in a compact trap that can be used indoors and out. Ideal for stables, kennels, gardens, and homes. Attracts and traps flies plus other flying insects, including aphids, white-flies, and leaf-hoppers. Always use in well-lighted areas. For outdoor use, place in a sunlit location. Indoors, place near a window or electric light. Pull up recessed handles and carefully remove trap from box. NOTE: The trap is coated with very sticky adhesive, so handle by top and bottom only. For best results, use several traps in different locations. Place trap on level surface or hang by the handles. Attach traps together by sliding a wire through the center hole. In gardens, hang trap from garden stakes. Stack up to 3 traps per garden stake. Replace trap when 80% is covered with insects. In areas exposed to wind, stake or weight down the trap, or use double-sided tape on the trap bottom to secure it to a surface. Keep out of reach of children, pets, and wildlife.